So I love to dehydrate food. My pantry is filled with gleaming jars of dehydrated produce. I’ve got sliced and diced carrots, sliced & diced onions, squash, okra and more. Pretty much anything I’ve grown in my garden I’ve dehydrated. I’ve turned into quite the dehydrating queen since obtaining my *Excalibur Dehydrator. Heck those 9 huge trays let me dehydrate so much more than I ever could before! When that produce is dehydrated I place them in clean jars in the pantry. I wanted to have chalkboard labels for my jars. 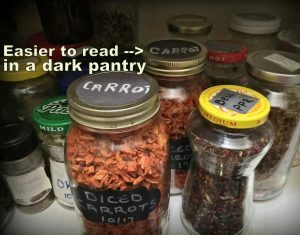 But when they’re all stacked on the pantry shelf, it’s sometimes hard to see what’s contained in the jars behind those in the front row. I needed a way to easily label the top of the jar when needed. That way I could see over the jars in front & still know the contents of the jars behind them. I went shopping for chalkboard labels I could put on top of the lid. Of course they’re out there but I wondered… can I make that myself? I first tried to make my own chalkboard paint using charcoal tabs, water & baking soda. But even though I lightly sanded the flat lids first, my homemade paint didn’t stick. #DIYfail. Back to the drawing board. No? Just me? (eh hemmm…) Moving on. I got a piece of black construction paper and traced the flat lid shape onto it and cut out the circle shape. I placed it on the flat part of the lids, screwed on the ring and gave it a try. It was perfect and made identifying contents in the back rows easier. 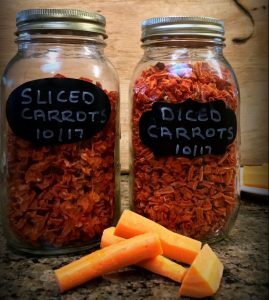 But the lid marking of the carrots in the second row is much easier to read than a piece of tape marking the lid of some of the other jars. Of course not all of my storage jars are canning jars so I’ll need to think about a solution for those repurposed jars not using a 2-part lid. Although it’s apparent that I need to practice my spacing and/or sharpen my chalk, it worked great. I don’t always store dehydrated goods in my canning jars but when I do this will be my go-to addition in labeling. And no money spent. SCORE! This entry was posted in Blog Posts and tagged Frugality, Make-It-Yourself on December 6, 2017 by Texas Homesteader. Well, I don’t have any black construction paper right now, but I DO have duct tape, and I think you’re brilliant for using it as a label too. I have a few different colors, so they might stand out better then the silver. You give great ideas even when you’re talking about something else. I’ve seen sidewalk chalk in the shape of crayons, maybe they would work until the pointy end wears down. I’ve never really thought about dehydrating, as I’ve always canned. But, I find I don’t enjoy the task so much as I did when I was younger; cooking in summer… so hot. 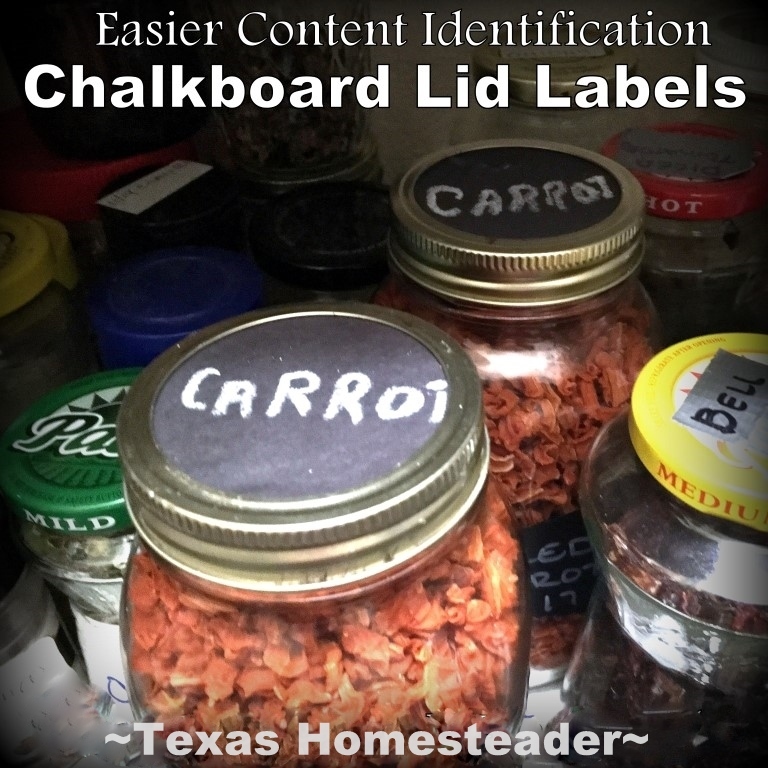 While your post is about labels, I think you’ve actually convinced me to try dehydrating my next garden! Walmart has a spray cb paint for under5$. I’ve had a can for about 5 yrs. I spray lids, fronts of shelves, shop cabinet doors (handy for keeping track of cut lists for woodworking), etc.